Pre-Race Ritual: I eat a light lunch more than two hours before the race, then I listen to music and watch the races until an hour to go while getting ready. 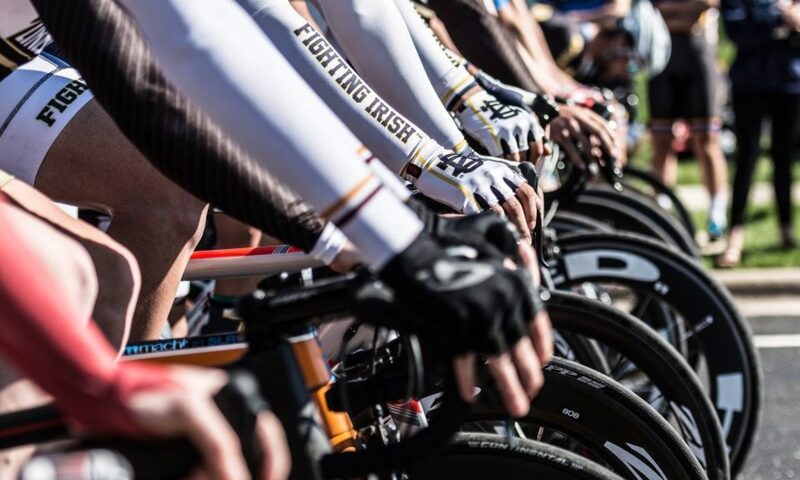 I usually kit up with about 40 minutes to go, and do a casual warm-up, and roll up to the line ready for a win to fall into my lap. Palmares: Climbed Mount Evans and Brasstown Bald. 2nd Place MWCCC Regionals in Men’s B RR at Purdue (2014). 2nd Overall in MWCCC DII Men’s A standings (2016). 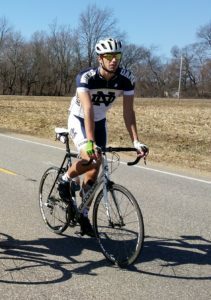 Qualified for Collegiate Road Nationals in North Carolina (2016). Contribution to Team: Music without words, always. Life off the Bike: Ironically, I love to sing, and play piano and guitar. My favorite book is A Christmas Carol, by Charles Dickens. I didn’t see a movie in a theater until after I graduated high school, but I love black and white films and shows from the 40’s and 50’s such as Father Knows Best, Hogan’s Heroes, Mr. Smith Goes to Washington, and my favorite: It’s a Wonderful Life. I am 6’3,” so I should have played basketball, but I have the biggest frame on the team at 63cm.